Stockport Edgeley. 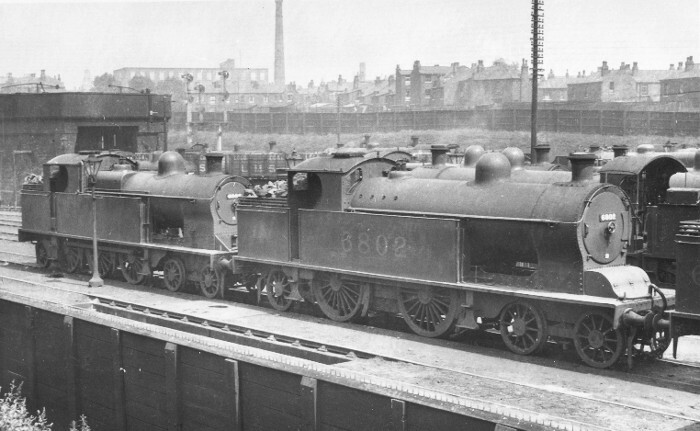 The buildings in the background correspond with a photo in Stockport Edgeley MPD by Michael S.Stokes (Foxline), page 30. Stockport Edgeley or 9B to all that worked there. The large water tank was fed from a softening plant located at Cheadle Wells about 3/4 mile away along the Cheadle village line. The photo was taken from between Stockport County�s football ground and the shed. This is Stockport Edgeley shed yard, looking north-east. The shed is off to the right; the Stockport to Crewe line is beyond the engines, Stockport station is about 700 yds off to the left, with houses in Range Road/Gilmore Street in the background. This looks like Stockport Edgeley shed, looking from the pathway that lead to the shed, with the Stockport County Football ground behind the photographer. The large building above the water tank would be the Shaw Heath Cotton Mill.